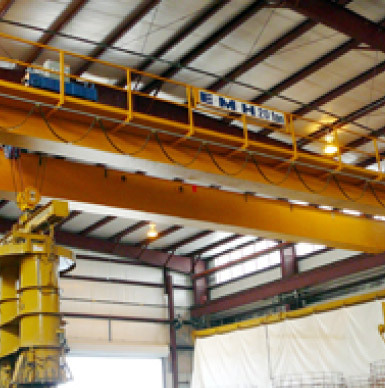 Jib Cranes For Every Need | EMH, Inc.
EMH’s jib cranes, just as the industry’s jib cranes come are available in one of three jib crane configurations. One of the three main jib crane configurations can be used for nearly any jib crane need. The three jib crane configurations are.. There are numerous ways to floor-mount jib cranes, and EMH can assist with mounting to best fit your jib crane needs. Your floor-mounted jib crane will have an upright mast, a running beam or boom, and a concrete foundation to allow the jib crane to stand upright on a factory floor without any other support. With a concrete foundation, a jib crane can work anywhere without any other support. A floor-mounted jib crane typically has a range up to 25’ reach and five ton rated capacity. Wall-mounted jib cranes, either stationary jib cranes or wall-traveling jib cranes offer flexibility without a jib crane taking floor space. EMH’s wall-traveling jib cranes are normally used in conjunction with overhead bridge cranes for frequent movement of smaller loads. Wall traveling jib cranes free up the bridge crane for heavier duty lifts, providing better work flow. AL Systems™ Pillar Style and Wall Mounted jibs are available in capacities from 250 lbs. to 1,000 lbs. with spans up to 15 feet..